Cooling the electric motor is a crucial cost reduction success factor in hybrid vehicles. Why? In the case of high-power motors, so-called rare earths are used as magnets. These are very expensive and on top of this the world market price also fluctuates considerably. Our client is determined to avoid this risk. Additionally, physics must also be considered: if the magnet becomes too warm, it demagnetizes itself and the motor instantly becomes a write-off. Therefore, the task required was to reduce the magnetic mass in the motor and improve cooling to the point that the component would be optimally cooled in all circumstances. Unfortunately, apart from the cost restrictions there was also not a lot of available space (the engine is integrated with the gearbox), the weight needed to be reduced, production needed to be simplified for one million units and the aim for the start of production was, “the day after tomorrow”. Since 2008, we have been helping our client – a premium OEM – to solve this exact problem in their hybrid vehicle range. 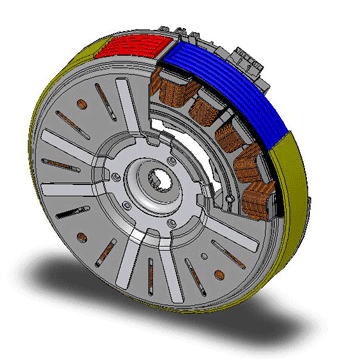 Over the years, a world of electric motor cooling software has emerged with which we can not only forecast all relevant geometrics, but also accurately simulate all driving scenarios. For confidentiality reasons, we are unable to publish any explicit numbers. However, the cost savings we achieved with our customer are in the double-digit percentage range. Projected across a unit quantity typical to automobiles these savings easily amounted to the kind of sum where one can easily say, “it was more than worthwhile for our customer”.